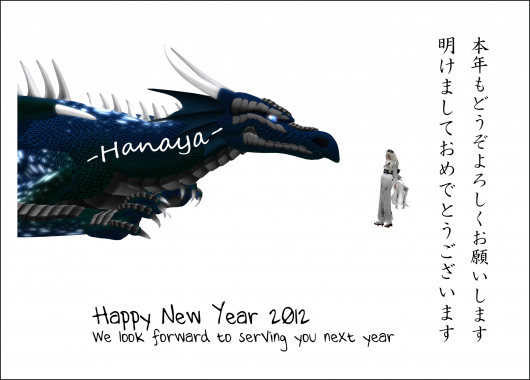 Wishing you all a Happy New Year 2012. Looking forward to another year of cute and fun things, as well as your continued support. 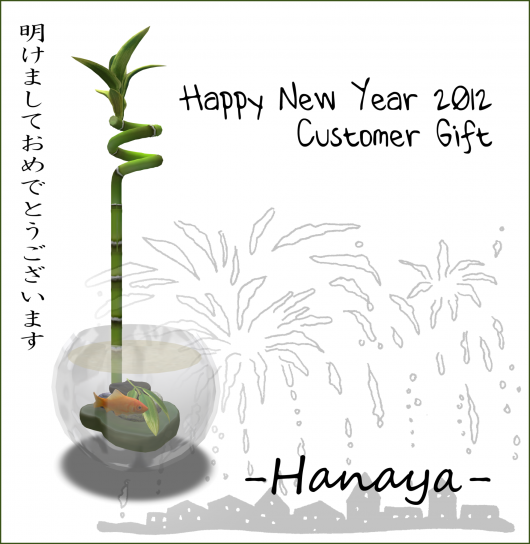 Please accept a small gift and a nengajo (a Happy New Year card). 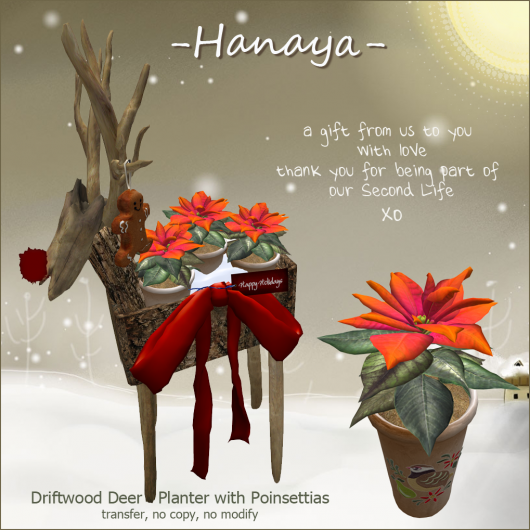 A small gift from us to you was sent out today on the -Hanaya- Yummy Collectibles in-world group and on the Subscribe-O-Matic. We hope it brings you luck in the Year of the Dragon. 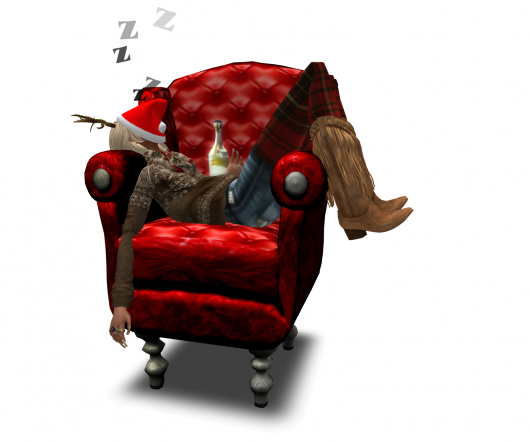 This entry was posted in Freebies and Gifts on December 31, 2011 by moriko. I don’t have much to say today – feeling lazy, slightly lethargic, and still stuffed from 4 days of overindulging on food, drink and Christmas treats. Although some of my fellow merchants seem to have been busy sending out mucho notices about SALES! DISCOUNTS! in the last few days, personally I do not believe in spamming my groups at this time of year with advertizing. Especially not on December 25th – so come on you guys, take a chill pill! As a matter of fact, I have not visited my store for a few days and it is a kind of nice vacation feeling. Kind of like when you work from home, but you keep the door to your home office padlocked shut, and throw away the key for awhile. This entry was posted in Chit Chat, Freebies and Gifts, Opinion on December 27, 2011 by moriko. As a Canadian from the frosty cold Ottawa Valley, I love winter weather, snow and wintery outdoorsy things to do. When winter can sometimes last as long as 6 months, you learn to love it – or hibernate inside. I love the sound of my footsteps crunching in really really cold packed snow. I love leaky eavestroughs when they allow the formation of icicles. I love the quietness of the forest on a dewy snowy morning. I love chickadees eating sunflower seeds from my mittened hands. I love skating on the Rideau Canal, the longest outdoor skating rink in the world. And I love big giant snowflakes falling on Christmas morning, creating a winter wonderland. So, I made some new wintery things – and a Christmas thing too. 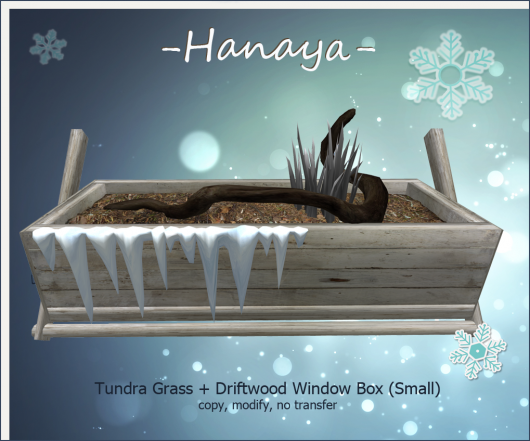 In my real life, I decorate my window boxes for each of the 4 seasons – so of course in Second Life I do as well. These window boxes are super low prim and detailed. The sculpt map for the box itself is fashioned after a window box that I made in Real Life. A smaller version of the window box – only 5 prims, so you can put one at each of your windows. I wanted a wreath to decorate all my windows, so it needed to be low prim. Besides that, I like simple. I think that 4 prims works – and if you use a viewer with shadows enabled, then remove the shadow prim, reducing the prim count to 3. How great is that? All of the above products are available for purchase at our in-world store, both in copy/modify and transfer/modify permissions, as well as on the Second Life Marketplace. Have a wonderful safe week, enjoy the holiday season and look for our special Christmas gift coming sometime in the next few days. This entry was posted in Product Announcements on December 18, 2011 by moriko. 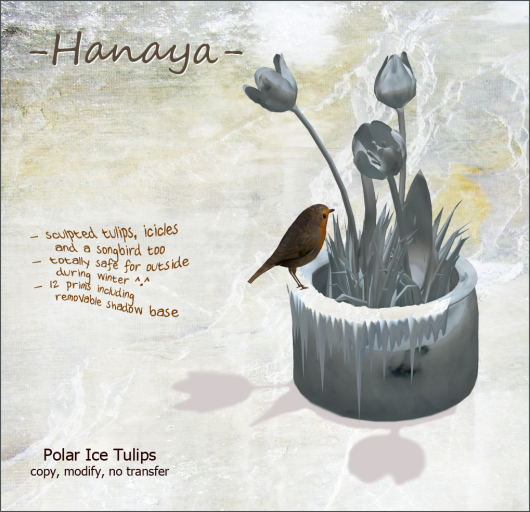 -Hanaya- Yummy Collectibles is excited to be part of the With Love, Again Hunt, organized by Keira Seerose of CHIC Management SL. The idea behind this hunt is that it is a way to say thank you to our customers who have supported us throughout the year. Each of the 100 participating stores have hidden a hunt gift, which is 10L. The gifts have a stated value of no less than 400 L. What a great way to say thank you. The hunt starts today and runs until January 6, 2012. Look for a place where even queens, presidents and the Dalai Lama go alone. The greenhouse is on display at our store, so you can see it before you grab it. Have fun hunting! 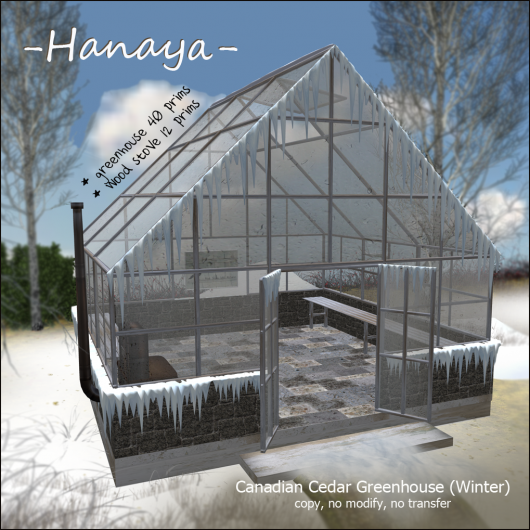 This entry was posted in Events, Freebies and Gifts and tagged -Hanaya-, CHIC Management SL, winter, With Love Again Hunt on December 9, 2011 by moriko. It is December, one of my favourite months of the year. So let me talk about Christmas trees, since the primary reason for this post is just that. 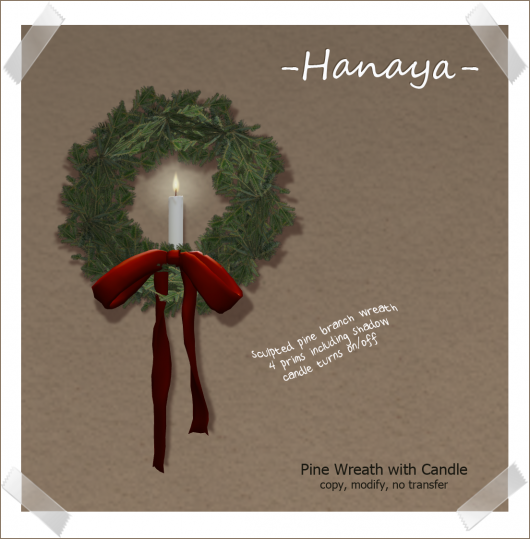 A brand new release from -Hanaya- to add to the thousands of pixel trees out there on the grid. But I happen to think this one is just a little bit special. Want to know why? 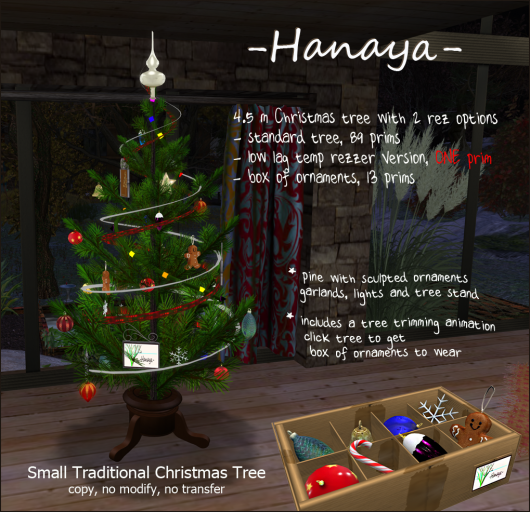 First, the new -Hanaya- Traditional Christmas Tree comes in 3 sizes to fit into most homes. And the best part is that those of you who are in the -Hanaya- Yummy Collectibles in-world group get the littlest one as this month’s group gift. Woo! Second, all three sizes of the tree come in 2 rez options – normal rez that takes up lots of prims, and a temp rezzer version with a custom-written, low lag script, which only uses 1 prim on your parcel. So, to describe the trees – they are sculpted pine trees with gorgeous glass ornaments of many shapes and colours. I also made a string of flashing lights and some garlands, and topped the whole thing with a shiny blown glass tree top. The tree sits in a wood tree stand and has a built-in shadow. All three sizes include a ‘Trim the Tree’ animation and give you and your friends or customers a box of ornaments to wear. A bare tree in a tree stand is also included in all three sizes, in case you want to hold off putting out the decorated one until it is closer to Christmas – like me. The small version of our Traditional Christmas Tree is 4.5 meters high – sure to fit a standard-sized SL home, which usually have ceilings that are at least 5 meters high. The ornament giver and ‘Trim the Tree’ animation are included. 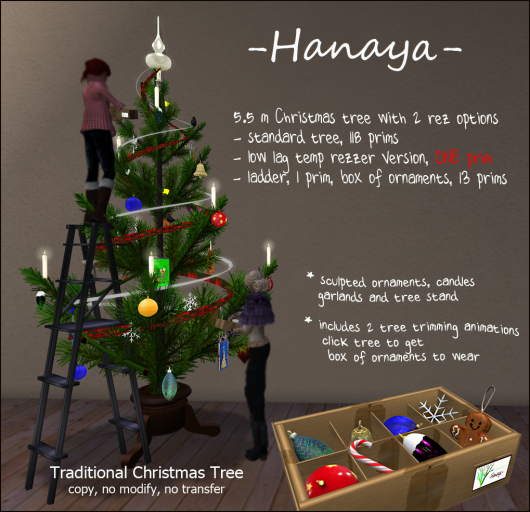 The littlest of our traditional Christmas trees is 3 meters high, and is our gift to our customers that are part of the -Hanaya- Yummy Collectibles in-world group. The tree includes the ‘Trim the Tree’ animation and gives the ornament box like the 2 ‘for purchase’ versions. The box of Christmas decorations which can be used to trim the Traditional Christmas Tree is a gift to our customers who are part of the -Hanaya- Subscribe-O-Matic Newsgroup. We hope that you will find room in your Second Life home for one of our Traditional Christmas Trees – one will be on display in our in-world store during the month of December. Or if you are feeling stressed and lazy, the purchase versions will be available on the Second Life Marketplace in the next few days. This entry was posted in Freebies and Gifts, Product Announcements and tagged Christmas, group gift, new product on December 2, 2011 by moriko. And if you are looking for a gift for the hard to buy for person, check out the roof-top and garden Art Gallery – all art is sold in no copy/transfer format. Right-click the gift box icon above the product vendor you wish to purchase. Choose ‘Buy’, and you will see the contents of the gift vendor, then pay to conclude the purchase. Your purchase will be a top-level folder in your inventory, named same as the product. 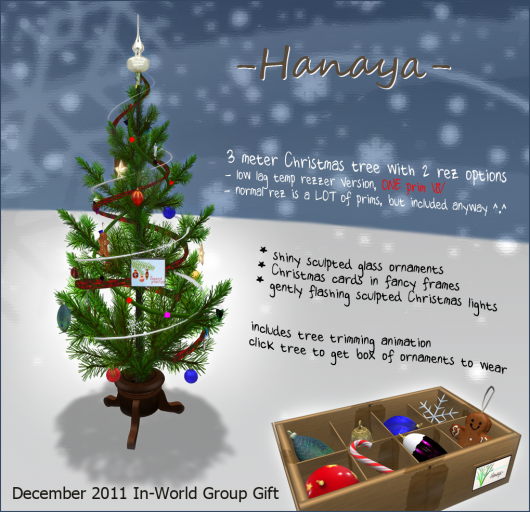 At home or at a place where you can rez, drag the -Hanaya- Christmas Gift Box from the folder. The box is mod/transfer. Edit the gift box, go to the Contents tab, then drag the gift you purchased into the Contents tab. Add anything else you wish that is transfer. Take the box back into your inventory. At Christmas, give the box to a friend or loved one and have a wonderful Merry Christmas! If there is a product that you wish to give as gift, which is not currently available in Gift Version mode, please contact me in-world. However, please note that items that are packaged in an auto-rezzer box (like our St. Lawrence Stone Gazebo), are not suitable for giving in no copy/transfer mode. As always, all our products are also available for gift giving on the Second Life Marketplace. This entry was posted in News on December 1, 2011 by moriko.